Brazilian Jiu Jitsu (BJJ) is martial art that focuses on ground fighting. It was adapted from Japanese Judo by Carlos and Helio Gracie. It promotes that a smaller, weaker person can defeat a larger, stronger person by use of superior technique. The most common approach to this is by finding ways to ground fight an opponent in such a way that submission techniques such as joint locks and chokes can be applied. BJJ was created out of the desire to create the most effective system possible for real fighting. Most people have become aware of BJJ from its success in MMA. WHY PRACTICE BRAZILIAN JIU JITSU? Self-defense: The fundamental purpose of any BJJ club should be to produce students who can defend themselves. A skilled BJJ practitioner can defend him/herself much more easily than a non-practitioner. When one trains frequently against other skilled individuals it makes the task of self-defense much less dangerous against untrained opponents. Physical Fitness: While practicing BJJ a student will increase flexibility, strength and endurance. Drastic improvements in physical condition and weight loss are frequently experienced by new students. Self-confidence: A student will begin to feel increased in self-confidence after practicing BJJ for just a short time. 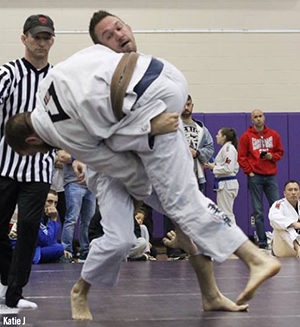 Sport Jiu Jitsu Competition: The popularity of sport competition has increased greatly in recent years. It is a great way to challenge oneself to achieve new levels of performance and to measure your performance against others. Sport competition is not required to practice BJJ. HOW DO WE PRACTICE BRAZILIAN JIU JITSU? Warm Up: An instructional BJJ class begins with a warm up. The warm up consists of motions and drills designed to prepare the body to train, teach BJJ specific movements and build muscle memory. Technique Demonstration: After warming up a specific technique is demonstrated by the instructor. The technique is practiced with a partner acting as a “dummy” without resistance so the student can focus on learning the technique in its purest form without additional obstacles. Once the fundamentals of the technique are understood the student can attempt to apply it in subsequent drills and training. "The best gym by far. Position Drilling/Sparring: The last activity of the class is practicing live with other students. This is most commonly referred to as “rolling”. When we desire to develop specific skills, positions or situations are chosen to be practiced in isolation. This increases a student’s skill in the given situation. At other times the students may start from a neutral position where the more senior student is encouraged to take a disadvantaged position from the start to help the development of the new student. These situations depend on the current lesson and the skill development chosen by the instructor. WHAT DO WE DO DIFFERENTLY AT CARLSON GRACIE COLUMBUS FROM OTHER BJJ/MARTIAL ARTS CLUBS? At Carlson Gracie Columbus we believe in producing skills that can be applied in any type of fight whether it is on the street, in an MMA fight or sport competition match. The Carlson Gracie style of jiu jitsu is well known for being highly effective and we focus on delivering that battle tested style to our students. We also strive to give our students the tools to be able to apply their jiu jitsu. We emphasize additional training in the striking and takedown facets of fighting. This approach enhances the ability of students to be able to choose how a fight will occur.